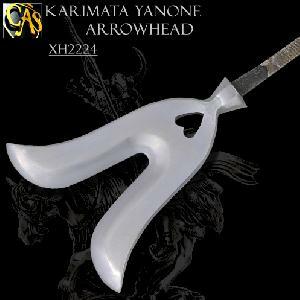 Our Japanese arrowheads (yanone) are faithfully reproduced from originals in museum collections. Some yanone were strictly utilitarian while others, like most of these examples, were beautifully pierced and decorated and used primarily for presentations and temple offerings. Most pieces fall into one of several broad groupings. The Torii, Dharma, Monkey Moon and Bamboo Butterfly fall into “Willowleaf” pattern, while the Swimming Dragon, Watakusi, Sakura and Fudo follow the Flesh Terror (Barbed) profile. The Karimata, Dragon Cloud, Boar’s Eye and Tiger Dragon are crafted in what is known as the “Rope Cutter” style, though it is more likely that this profile was used for hunting big game rather than cutting ropes. 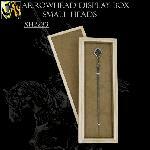 These arrowheads, either singly or in groups, are outstanding collectibles and conversation pieces.